I decided to write this post to help all the brides out there with the process of planning their wedding theme, and to organize all the information for them to make the process easier. After setting the date, finding a reception venue, etc; the next thought on your mind might be your wedding colors or color palette. Your colors are one of the more important aspects of how you plan your whole wedding day. The wedding colors that you decide on will inevitably play a big part in setting the mood of your wedding, and theme as well. One thing to consider when you are in the selection process for the colors is to remember that absolutely everything — from the invitations all the way to the bridesmaid dresses and the cake — need to match accordingly with the wedding theme. From dresses to flowers, from linens to place cards, the colors you choose will set the tone for the entire event. From the minute a guest receives her save-the-date invite to the thank-you card sent after the wedding, your colors will set the mood for the entire wedding. Your color scheme for the wedding has the power to set the vibe – so choose wisely. Focusing on the color theme early on is important to ensure that everything else obtained for the wedding is well coordinated and suited to the wedding as a whole. Spring and summer affairs usually include pastels or brights. Winter suggests deep purples, burgundies, grey-greens, and silvers. Fall brings harvest tones – oranges, reds, and yellows. Look at the colors used in your venue’s carpeting, drapery and decorations. If the site has strong colors, you’ll need to select a color scheme that complements it. When deciding on a wedding color palette, play up the prominent colors of your site or setting. For instance, if your wedding is a beach wedding, the natural choice is blue. If you’re getting married at a country club with navy and maroon oriental carpets, lime green and hot pink details won’t match the colors of the setting. What kind of wedding will yours be and what will the mood be? A romantic affair? Formal? Casual? A bride that wants a quiet, intimate wedding may want a different type of atmosphere than one who will have a lively “party all night” wedding. Black and white is usually a setting for a formal wedding. Black represents power, sexuality, sadness, elegance or anger. It speaks of formality and sophistication. Green relaxes people and symbolizes nature, health, renewal, jealousy and even fertility. Yellow represents optimism, joy, hope and sunshine. Yellow makes everyone smile. It’s a happy spring, summer or fall color and can take on many different moods when paired with one or two alternate colors. Blue is one of the most calming wedding colors. An easy way to find colors for your wedding is to look at pictures from past real weddings. You can also have a look at blogs like Style Me Pretty, Ruffled Blog, Once Wed, Junebug, and Green Wedding Shoes to get inspired. Pinterest Inspiration Boards have become a great tool for coordinating colors and finding ideas for your big day. You can make boards that are specific to a certain color, element, or season. Which colors are you drawn to most? Is there one particular color or several? If there are several colors, are they compatible? Pick wedding colors that will coordinate with the wedding dress, bridesmaid dresses and other wedding accessories. Complementary Colors are opposite each other on the color wheel, such as blue and orange, or red and green. Analogous Colors lie next to each other on the wheel, such as green, lime green, blue-green. Monochromatic Colors have variations of the same tone, such as bright red, dark red, etc. You can use different combinations of color to set the mood you wish to convey. For weddings it is typical to use a complementary color schemes, rather than a monochromatic scheme or clashing scheme. A complementary scheme is a color combination of any two colors opposite on the color wheel. Let your wedding transmit the exact message you want to convey to your guests with the colors you choose for it. 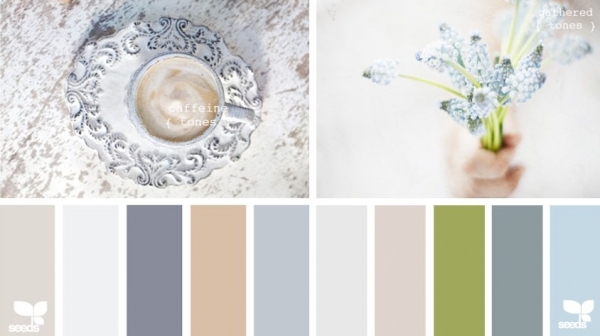 For more color palette inspiration, check out Perfect Palettes on Pinterest and their inspiration boards. Also take a look at my Pinterest Wedding Color & Inspiration Boards. When you are choosing a venue for your wedding, you should take into consideration that the venue will affect the type of wedding you are going to have. The venue that you choose will have a big effect on the wedding theme. The venue reflects the type of wedding you are going to have. For example, if it’s an indoor wedding in a glamorous venue, the theme can be more sophisticated, modern, formal, and glamorous. Then, all the elements can be used to further convey that feeling – through flowers, cake, lighting, bridesmaids dresses, the bride’s dress, etc. If it’s a backyard wedding, the venue will give a much more casual outdoor feeling – not formal. When picking your wedding theme it is important to think about which season your wedding will be in. Spring and summer affairs usually include pastels or brights. Winter suggests deep purples, burgundies, grey-greens, and silvers. Fall brings harvest tones – oranges, reds, and yellows. A spring wedding is fresh and beautiful. However, unless you plan to marry in late spring, it is best to plan an indoor wedding. Fresh spring flowers, like crocuses, tulips, snowdrops, and pansies are lovely and colorful, and make great centerpieces. Dressing your bridesmaids in cheerful and bright colors mimics springs bursts of life. You can use a color run (dressing each attendant in a different color of the same style dress) to imitate the look of colorful flowers. Many brides are beginning to choose wildflowers for their bouquets. Summer blooms of daisies, buttercups, and other pastel and light colored flowers make excellent choices for the bridal and attendant bouquets, as well as for décor. Colors inspired by summer’s easy-going attitude are pale, like pastel yellows and blues, reminding guests of blue water and sandy beaches. Sundresses make elegant and simple dresses that can be used by the bridesmaids – or even the bride. This season presents many beautiful possibilities. Adding colored leaves to a bouquet of roses is a unique and charming touch for a bridal bouquet. Have boutonnières and attendant corsages made from groupings of autumn leaves of red, yellow, gold, and even dark purple. Colors that make good décor for fall weddings are earth tones: rusts, golds, yellows, and light browns. Dark, rich color is reminiscent of winter. Burgundy, deep blue and green, and even dark purple all add warmth to your reception. Choose a hall or church with wood accents to increase the warm feeling. Faux white fur on your dress, and faux fur trim for the bridesmaid dresses can add a wintry look to your wedding party. You can even indulge in a Christmas theme. But rather than put bridesmaids in bright green and red, instead clothe them in toned-down gold, or silver-gray. This is a more elegant Christmas motif. For a seasonal guide to flowers, check out Which Flowers are in Season for a Wedding and When. The list is organized by color, so once you’ve selected your wedding season, you’ll be able to figure out which flowers to pick in the color you want. For more, also take a look at Wedding Flowers by Season. When you think about the theme of the wedding, you have to ensure that all the elements of the wedding are well coordinated and suited to the wedding as a whole. There should be a theme of the wedding in which all the elements compliment each other. Your wedding gown provides the background color for your bridal bouquet. Whatever color you choose, however, the color of your flowers must complement the color of the gown you’re wearing. A bridal bouquet should be part of the total picture and shouldn’t stand-alone. It should tie in with the color scheme of your bridesmaids dresses. Before meeting with potential florists, gather as much inspiration as possible – including styles you like as well as those you dislike. If possible, collect photos, color swatches of linens and bridesmaid dresses, invitations, etc. to bring to the meeting. This information will be a great starting point and will, hopefully, convey the theme and vision you have for the wedding day. Get familiar with the different types of flowers — especially your favorites — and the colors they come in. Another factor in choosing the bouquet is thinking about the theme of the wedding and the other elements in the wedding. That means the flowers you choose should compliment the look of the bride’s dress, the bridal party dresses, fabrics and colors, and their flowers. For more bouquet ideas, have a look at my Pinterest boards: Romantic Bridal Bouquet and White Wedding Bouquet. You can mix the type of dresses to give a different look, and make the style less cookie-cutter. This way you can match the dresses to the individual bridesmaids by the size and body shape to get an interesting combination. For more inspiration on Bridesmaids dresses, take a look at my Pinterest board, Bridesmaids Dresses, and My Bridal Fashion Guide to Bridesmaids Dresses. When you are considering wedding decor, you need to think about all the other elements in the wedding. The decorations should complement the dress, colors, theme, season, mood, style, etc. For more wedding decor inspiration have a look at my Pinterest board, wedding decor. Many couples don’t really put a lot of thought into the cake, and just let the catering company from the venue figure it out for them. I think the cake is also an important element of any wedding. The cake should compliment the feeling of the day, the colors and the theme.